Question: How does one “defrock” a lesbian? Answer: You slap the “frock” out of her. The highest court within the United Methodist Church defrocked a lesbian minister Monday for violating the denomination’s ban on “self-avowed, practicing homosexual” clergy. The nine-member Judicial Council—seven of whom heard the case Thursday in Houston—issued the ruling through its Web site. The denomination’s communications office is based in Nashville. A church panel decided in December that the Rev. 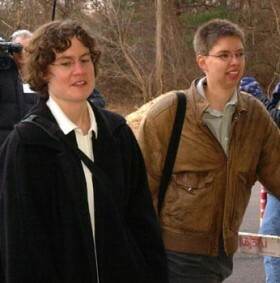 Irene “Beth” Stroud, 35 (pictured at left with her “artner"), by being in a lesbian partnership, engaged in practices that the church has declared incompatible with Christian teachings. The panel’s decision was overturned by the Northeast Jurisdiction Committee on Appeals, but the Judicial Council backed the original ruling. “An issue like this takes so much energy on both sides, and takes the focus off a lot of the great things the church is doing,” Hall said. “This gives us some space so we can hopefully channel our energies into the great things we’re doing.” The UMC is the nation’s third-largest denomination. Stroud, who became an associate pastor at Philadelphia’s First United Methodist Church of Germantown in 1999, has said she never revealed her sexual orientation in documents related to her ordination, but didn’t keep it a secret. Stroud will continue as a lay staff member at her congregation, preaching, supervising children’s and youth work and conducting pastoral visits. She told the congregation Sunday that she and her partner are applying to be foster parents. “There’s really no question that the United Methodist Church practices discrimination. That’s been made abundantly clear,” she said.